Please note, posts may be less frequent between now and Labor Day. The August Virtual Tasting will take place on Tuesday the 31st from 7-8pm Pacific Time. Read more about it here. 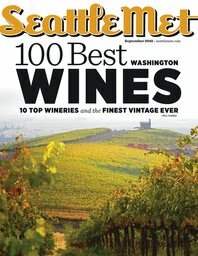 I had the pleasure of writing an article on Washington wine in September's Seattle Metropolitan magazine. The issue should be on stands today. Read an on-line version of the article here. Enjoy! I spent the past hour just reading the article. Thanks for the in-depthness of it. Can you have a members tasting next time? It must be like Christmas when those bottles roll in! What an incredible list! But I'm more interested in what didn't make the cut. Conspicuous in their absence are Reynvaan, Chateau Rollat, Gorman Wineries etc. Are we to assume that these wines were submitted and didn't make the cut? Or weren't submitted at all. It would also be cool to know if you got your favorite wines from all the winemakers. Or was it, "Man, Pirouette again! Sequel is far superior...."
RE: 20 best Syrahs in WA. Stever Tanzer did an incredible lineup of Syrah during his last visit to WA. It was a private event that featured 15 or so Syrah from the 07 vintage. All the hitters were there. Was an absolutely incredible tasting. He did a review on his blog. We're going to make sure Mr Sullivan gets an invite next time. I will say that I think the wineries you list are each making phenomenal wines. A shame not to have them represented. For the list of 20 best Syrah, I saw the list from the Tanzer event which looked absolutely incredible. Definitely check it out. Cheers to a fantastic article! I have not been a big wine drinker in the past but a recent trip to Sonoma followed by reading your article has me hooked. Although I always love Seattle Met (I am a contributor), your article put this issue over the top. Will, thank you very much for the kind words. There is definitely much to enjoy in Washington wine, so it's a great time to dive in. Have fun! I was waiting in the checkout lane at a QFC grocery store yesterday, and there was the Seattle Met magazine right at eye level. I got a big grin on my face after realizing that yours isn't just a feature article but the big cover story (this is what happens when I read everything online). Congrats!